The quilting world is blessed with generous, loving quilters who give of themselves, their time and talent on an on-going basis. The Giving Quilt will be recognizing some of these selfless, unsung heroes with a certificate of appreciation. If there is someone in the quilting world that you wish to acknowledge in this way, please contact a Giving Quilt board member or send an email to thegivingquiltinc@gmail.com with the name of the person and details regarding their contribution to our community. The Giving Quilt is proud to shine the spot light on two extraordinary local quilters, JoPaula Lantier and Renee Hoeprich, for their tireless efforts to collect and coordinate donations of fabric, notions, books, tools, and sewing machines for the many quilters who lost their sewing rooms and quilting supplies in the Great Flood of 2016. It started simply. Quilters who had not flooded began volunteering to wash quilts and fabric rescued from the flooded homes of those who had. After ten days of marathon washing, JoPaula and Renee found themselves instant messaging late at night and wanting to do more. But what? A conversation with New Orleans quilt shop owner and Hurricane Katrina survivor, Denise Taylor, pointed them in the right direction and Bridge Over Troubled Waters was born. By mid-September collection bins were in place in quilt shops from Slidell to Shreveport and donations were pouring in. A storage unit was donated to house the rapidly rising river of donations, but ultimately 3 storage units were donated and the overflow landed in the Lantier and Hoperich homes. As donations grew, they collected the names of flooded quilters from quilt shops and quilting guilds and mailed out 146 letters inviting these quilters to a day of free shopping on April 1, 2017. By then 10,000 yards of fabric, 90 sewing machines and numerous tools, notions, books and patterns - many donated by national vendors - were all waiting to go home with the special shoppers. On April 1, hugs, tears, and numerous words of thanks were the order of the day as 120 quilters arrived at Highland Presbyterian Church in Baton Rouge to pick up the donated sewing machines and supplies. An army of volunteers was also on hand to help with the distribution, including several who had also flooded but were glad to help other quilters. Quilters are by nature generous and Renee says this “sharing quality” is one of things she likes best about being a quilter. She grew up helping her mother with various community service projects and always endeavored to do the same. A quilter for 28 years, she feels the art provides her with a unique opportunity to try a wide variety of techniques, add her own special twist, and still provide a useful finished product that combines art and utility. Renee is currently president of Gulf States Quilting Association and past president of River City Quilt Guild in Baton Rouge. JoPaula grew up around quilts but didn’t start quilting until she retired from LSU in 2008. Since the BOTW event she has received numerous thank you notes from the recipients and is overwhelmed by their gratitude. She is constantly amazed by the spirit of the quilting community and feels honored to have been able to do what she could. A former president of River City Quilt Guild, she would also like to thank the many quilters of the area for their generosity and support. The Giving Quilt, Inc. is proud to announce that our Volunteer Spotlight is focused on quilt shop owner Daisy Comeaux of Cottage Quilts & Creations in St. Gabriel, LA. In her spare time she is also the current president of River City Quilt Guild in Baton Rouge and a group leader for The National Quilts of Valor Foundation. A busy lady, Daisy has a long history of donating her time, energy and talents to various worthy causes. She began supporting TGQ soon after it was incorporated and designated as a 501(c)3 non-profit. She not only helped us procure the St. Gabriel Community Center for the first official Giving Quilt Show, but she also arranged for the Knights of Columbus to provide food for the event. She also helped procure several corporate sponsorships during our early days as a fledging corporation. Because of her many contributions and wise counsel, TGQ found its wings. Since those early days, Daisy has continued to contribute in many ways. She has given us discounts on fabric for multiple projects and has donated part of the profits from the sale of challenge fabric to the group. She has sponsored awards for the quilt show challenge winners, and she is always on the look out for corporate sponsorships. This year she was instrumental in contacting with the challenge fabric manufacturer. We can be assured that the fabric will be available over the course of this challenge. But most of all, Daisy has a generous heart and gives expecting nothing in return. Her recognition as an outstanding volunteer is way over due. The Giving Quilt spotlight is shining on Patti Jarreau! Patti remembers playing with dolls under her mother, Bobbie Stirrat’s, sewing machine while she sewed. Bobbie, an excellent seamstress, made all of her daughter’s clothes including their bridesmaid and wedding dresses. Patti said she was 16 before she got a store-bought dress. Patti remembers always being interested in fabric and in sewing, and sewed for her sons when they were smaller. In the late 1980’s, Patti became interested in quilting. She loved going to The Thimble, the only local quilt shop, to visit with Willie Holt and Myla Sue Matherne. Patti joined the River City Quilt Guild which only had about 15 members back then. Soon after, she joined Remember Me. She influenced co-worker, Suzi Montague, to join both guilds too. Patti has always been “up for a quilt trip” and went on many retreats and excursions. Patti, Suzi, and Eileen Parent (who has since moved to Maine) became regulars on quilting adventures. Patti was always the trip organizer, always bought something, and always enjoyed herself wherever she went. Patti has a giving heart and was presented with a Giving Quilt certificate of appreciation on May 10, 2014, at Patti’s Pillowcase Party. For years she has supported the Giving Quilt and Wasted Women with regular donations of high-quality fabric and quilting kits. Patti says that like many quilters, she may “over buy” a little. Since her stroke she has trouble cutting accurately and has found kits with precise amounts of fabric challenging. Instead of despairing, Patti has seen those kits come to life through her donations. Both Patti and her husband Cecil are cancer survivors. She gets much joy from making and donating pillowcases to children with cancer. Patti has used her “tribulations” to bless others. Patti, thank you. We love you. 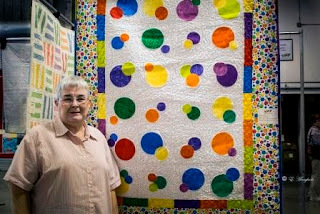 The Giving Quilt spotlight is shining on Norma McDaniel. She is an accomplished seamstress who made the crossover to quilting several years ago. As early as 2008, she offered to quilt tops for the Wasted Women Bee as a method to increase her quilting skills on her new long arm machine. Since that first stitch, she has not stopped adding her creative touch to the quilt tops that have been sewn by our dedicated group of quilters. Her service to The Giving Quilt via Wasted Women has been truly remarkable. As the primary machine quilter for WWB, Norma has donated countless hours to our cause, often using her own supplies to get the quilts back to us in record time. When there were no tops to quilt, she would take home a kit or two with her to sew, and then quilt (and she does binding, too!). To quote Norma , “Quilting became my passion, my therapy. For a few years I sold my quilts as well as other projects, at a local craft fair, which was held annually. That became a “drudge” because I was spending the whole year replenishing my inventory and had no time to enjoy the art of quilting or learn new styles and techniques. I graduated to an official long arm quilting machine on a 10 foot frame . My name, “Stitches ‘n Styles” may not sound appropriate for a quilting business, but it seems to have stuck.” She definitely has style in her quilting today.